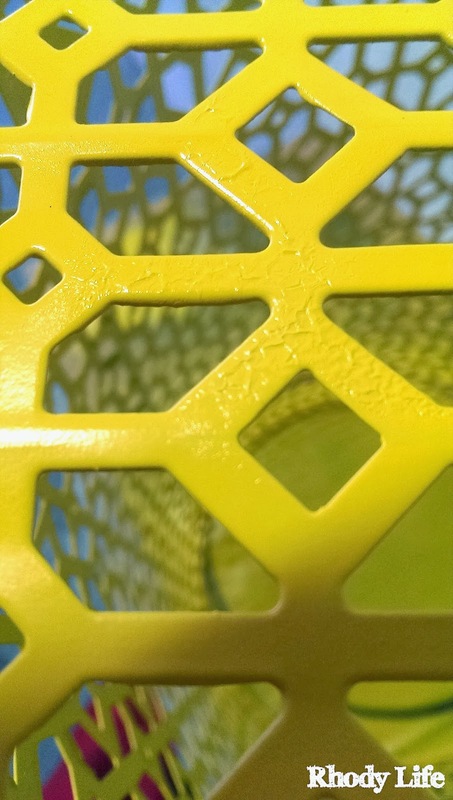 A long, long time ago, last year, actually, after I revealed the Family Room Design plan, I ended up taking a trip to Target, where I found that the little side table that I wanted was marked on Clearance and was going to be discontinued. I snatched it up and brought it home with me, and then it sat in a closet for 8 months. A few weeks ago, I took it out and brought it into the garage to be painted yellow. Because the finish on the table was so shiny, I decided to rough it up a little bit first, using some medium grit sandpaper, and going over all of the sides and the top. I decided to go with a spray paint for a more even coverage. 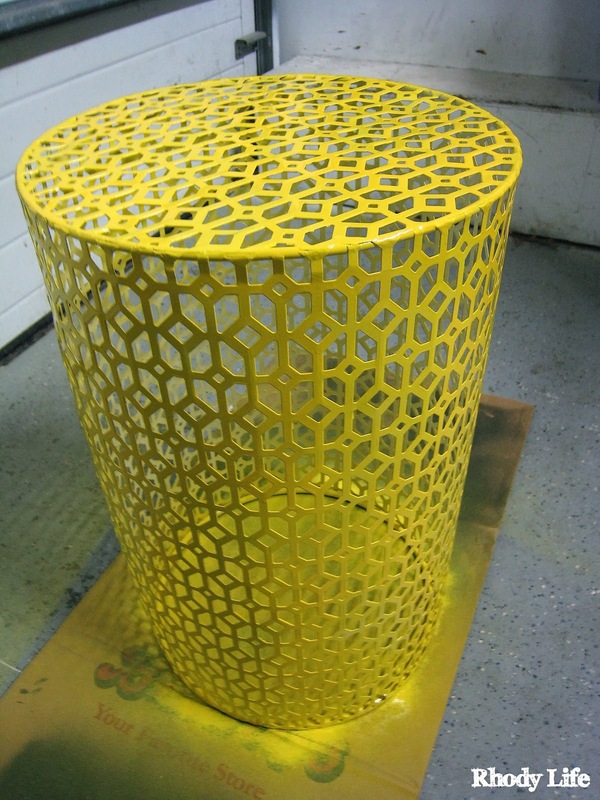 In addition, trying to paint this side table with a brush would have been difficult considering all of the cut outs in the metal. I likely would have ended up with drip marks all over the place. 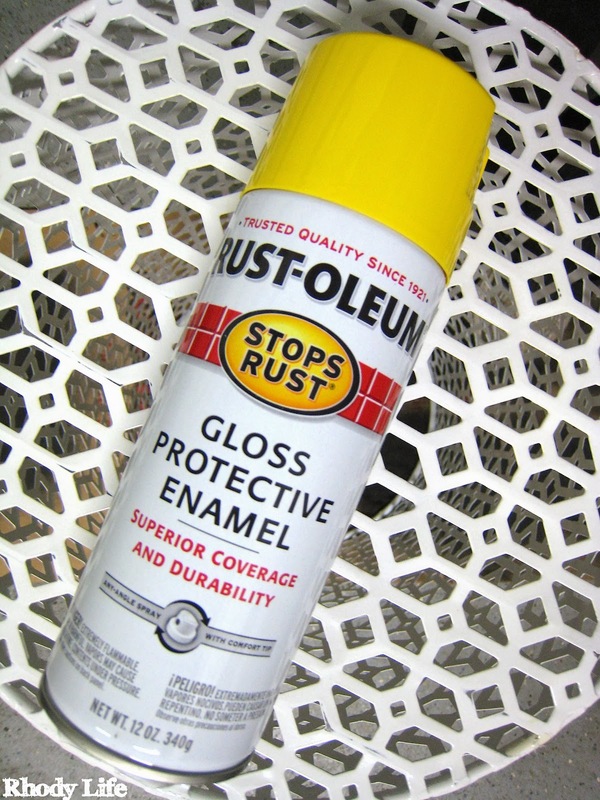 Also, since I really liked the shine that it had before I sanded it down, I decided to go with a glossy spray paint, so I picked up some bright yellow paint from the hardware store. I'm glad I went with a primary yellow for the room, because finding the right shade of yellow would have been difficult for spray paint. 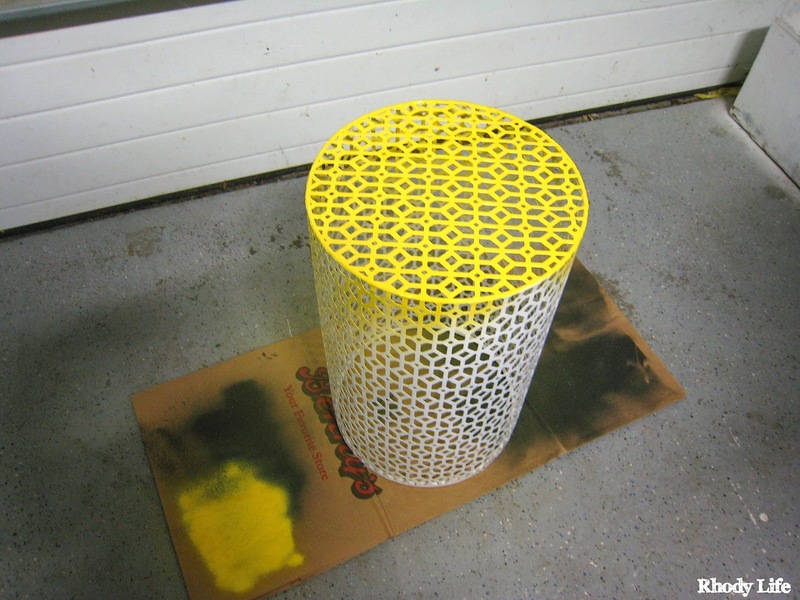 Starting with the top of the table, I began spraying it yellow, making sure that I was at least a foot away from the table and moving the spray can in even widths and speed across the top. After the top was sprayed, I moved onto the sides, going in a horizontal back-and-forth pattern down the side of the table, and then rotating the yard waste bag that I put the table on so I could get to the other parts of the table. Because I was working in my garage only a few weeks ago, the temperature was much colder than suggested by the spray paint can directions. I ignored these though, and used it anyways. The spray paint was fine though, because it was being stored inside the house. 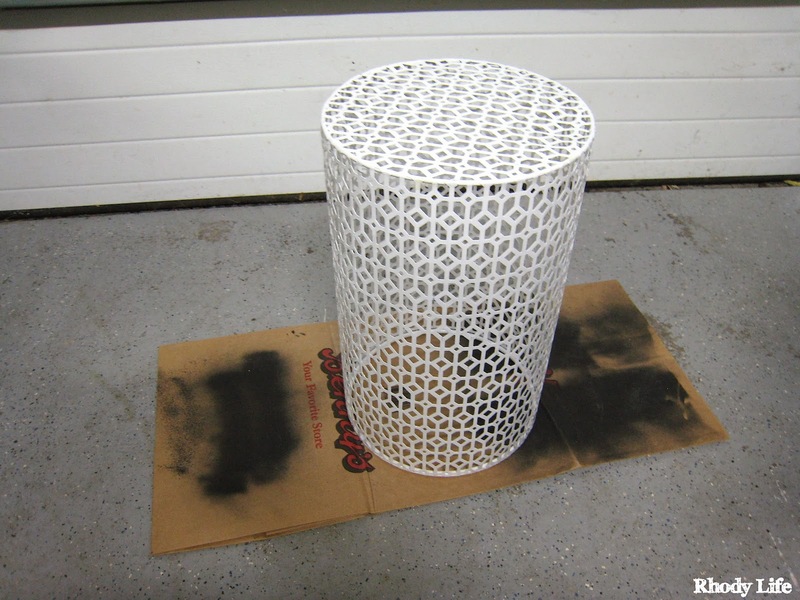 The problem ended up being the table - it is made of metal and was being stored outside in the garage, where the day's high temperature was somewhere around 20 degrees, the metal was so cold that as soon as the spray paint hit it, it was wrinkling and almost shriveling up. As you can see above, this is what I ended up with in different places on the table. And surprisingly, I am ok with it. I think it makes it a little cooler, actually. Plus, it's not really noticeable unless you are pressing your nose up against the end table, which I highly doubt anyone will be doing at my house. Unless, of course, they read this post and actually want to see the crackling for themselves! Anyways, once I had the three coats of spray paint on my table and let them dry, it was ready to be placed in the family room. Originally, the table was going to be on the purple shag rug that I bought for the space, but it turns out that an 8'x10' rug in that room is SO much smaller than I thought. So, the table is going to end up off the rug, but still on the side of the couch. With the bottom of the table being metal, I was afraid of it scratching the hardwood floors, so I came up with a way to protect both the table and the floors - silicone! 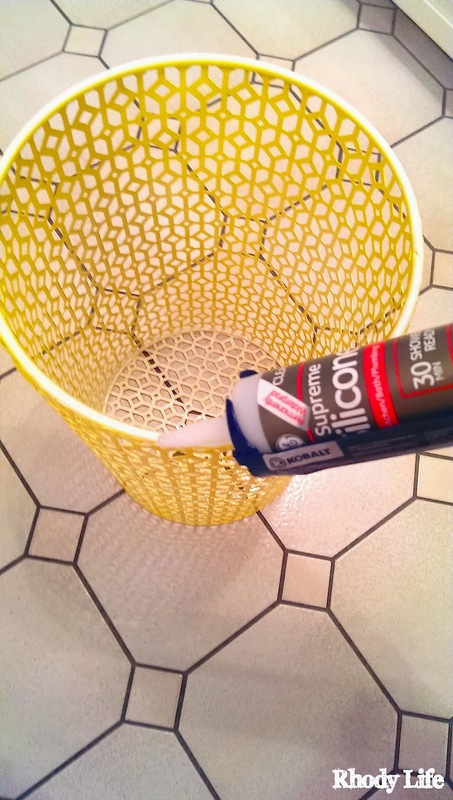 I took out my trusty caulk gun, and my ever-so-popular tube of silicone, and spread a generous amount around the bottom of the table, making sure that I didn't go too far to one side or the other. Once the silicone was on the rim of the table, I used a few toothpicks just to make sure that it was even in terms of height and that there weren't any spots that I missed. Also, since I overlapped the starting and ending point, that needed to be smoothed out a bit so that it was even with the rest of the rim. I let the silicone sit and dry for 24 hours, although it probably wasn't necessary to wait that long. You can check your tube of silicone for the actual recommended drying time if you're impatient. Once the silicone was dry, I flipped over the table, set it on my hardwood floors, and voila! 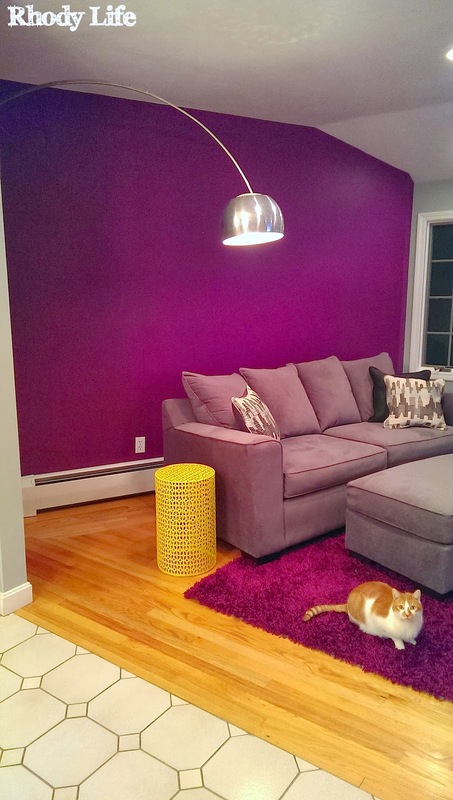 I had a great pop of color for my family room, and one of the best parts is that the silicone is protecting the floors from scratching, and from sliding around, since curious kitty cats like to explore all the new things that are popping up in our home! It's amazing how much life the yellow brings to the space compared to the white! Have you ever revamped a little side table for your space? 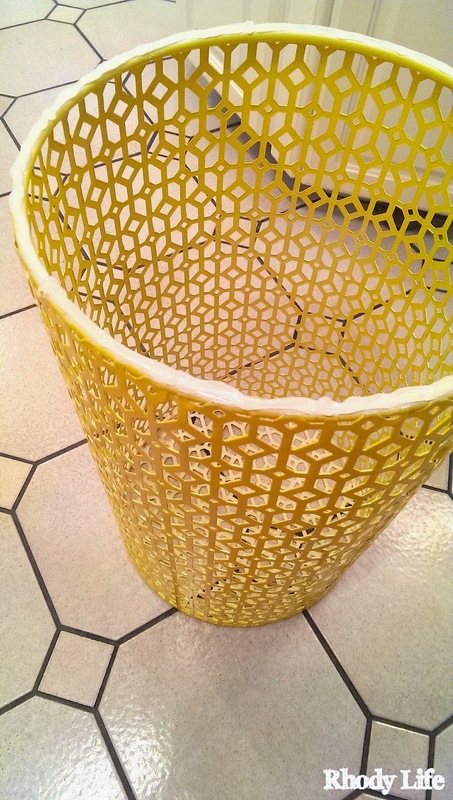 Would you ever consider using primary yellow in your home decor? I love the pop of yellow. The graphic look is really nice.